Editor’s Note - This past spring, Sam French, Melissa Makepeace, Colleen Gentemann and Sarah Sasges set off to Mt. Edziza Provincial Park with plans to ski tour the entire park from bottom to top, crossing over the Spectrum Range and Mt Edziza. The planned traverse is 68 km long with 4,325 metres of elevation gain and 4,190 metres of elevation loss. Less-than-ideal conditions presented the team as they were met with biting winds, icy slopes and several rock obstacles. A meticulous study of the terrain revealed a workaround that would allow access to crucial drainage along the way, however a final vertical rock wall blocked them. Melissa writes about the difficult decision to turn around, but also the redeeming turns the team experienced at their pick-up point. Thanks for sharing your story with us Melissa - it was no doubt a hard journey! The trip was funded by the ACC Jen Higgins Grant for Young Women - more detail below. On April 23rd 2018, Sam French, Sarah Sasges, Colleen Gentemann and myself drove from the southern Rocky Mountains to Dease Lake, about 600km north of Terrace BC on the Alaska highway. 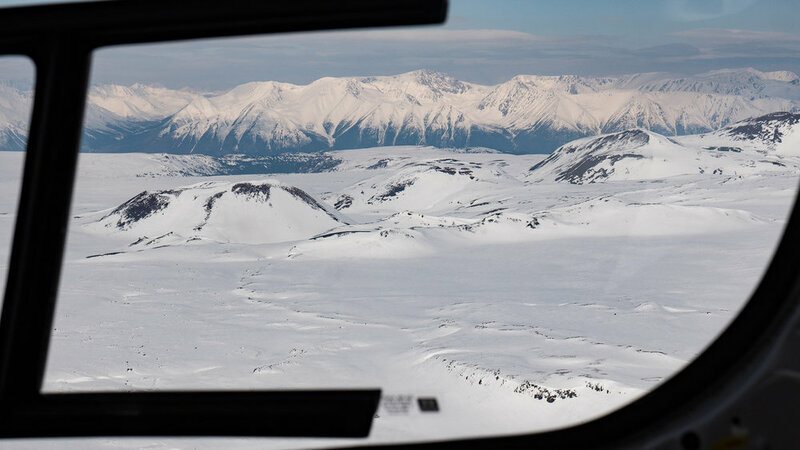 We arrived at Lakelse Helicopters and loaded our gear, flying approximately 80km to the southern end of Mount Edziza Provincial Park. Mt. Edziza Provincial Park was established in 1972, with its namesake being BC's highest volcano at 2,787 meters. We were drawn to the area initially because of its relative obscurity. Online photos of an alien landscape, preserved cinder cones, black volcanic rock, and ridges stained with brilliant shades of red and orange, enticing us to make the long journey north. In an effort to protect the ecological integrity of the park, landing a helicopter is only permitted at one of four designated lakes - we landed at Little Arctic Lake, as it’s the furthest south. We began our ski toward our objective, Buckley Lake. The lake is located about 80km away, over the Spectrum Range and over the glaciated plateau of Mt. Edziza to the park’s northern boundary. We planned for the trip to take 8 days and had 2 days of contingency food packed. Our packs were heavy as we ascended the first ridge. The aptly named Spectrum Range features patches of sunset coloured rocks, as if they have been graced with a watercolour brush. The ridge itself created islands of thin snowpack that whumpfed as we hopped from one to the next. The spring weather was perfect as we descended into the Yeda drainage. Hopes were high as we approached our next ascent, a broad ridge to gain and navigate northward toward what we expected to be a fun ski down the small remnant of the Nagha glacier. When our skis crested the ridge top, we were instantly battered by extreme wind. The snow surface was compact and ice-like. About 100 meters from the point where we hoped to begin our descent into the Nagha drainage, a rocky buttress halted our progress, with the slope below resembling an ice rink. Defeated, we headed back down the ridge, seeking out a slope we could safely ski. After some very loud "skiing", the snow finally softened, allowing for a few decent turns before we glided down the Yeda creek to find a spot to camp. After dinner, we huddled in the tent, eyeing up the broad mountain range that loomed over us. We searched and evaluated every possible inch of that mountain, hoping to find the key that would lead us up and over into the Nagha drainage. After pouring over the maps until our hunched backs called for mercy, we decided the best route would be to head west and contour around the mountain. This would add over 15kms to our trip, but it looked like the best option. The next morning we began the trek to the west. As the sun crested the horizon to the east, the low elevation snow became soft and we found ourselves punching through to the ground - this made for tedious travel. We took turns breaking trail, and when we rounded the ridge and began to head to the east again, we were dumb founded by the spectacular view of a mesa-like plateau, with stacked striations of crumbling rock that reached from the valley bottom up to the base of the Mt. Edziza glacier plateau. We were also incredibly defeated as the weakness we spied on the map, the one we hoped would lead us into the next drainage, was guarded by a short, but vertical rock wall. Once again, we set up camp and examined the maps looking for possible ways to get around these road blocks. To be denied entrance to the Nagha drainage two days in a row, at the beginning of our trip, led us to the conclude that not only was it proving to be difficult for us to get into the Nagha, but that there may be many more of these impasses. With the helicopter not being permitted to land anywhere in the park between us and our destination, we made the difficult decision to turn around. After trudging back toward Little Arctic Lake through isothermal snow, we finally gained higher and more solid ground, finding a sheltered depression in the flat expanse surrounding the lake, where we set up camp. We coordinated our pick up for three days time, which gave us the opportunity to ski the peaks surrounding our tents. Our spirits lifted as we proudly exclaimed that each ski descent was likely a first. The landscape of Mt. Edziza Provincial Park is remarkably unique. Flying from Dease Lake to the southern end of the park provided a spectacular perspective of the terrain we had intended to traverse. If you find yourself motivated to try and complete our unfinished project, starting at Little Arctic lake not only offers southern aspect ascents, with northern aspect descents, but also the opportunity to scope your lines. Despite being a healthy year for snowfall in the area, Mt. Edziza resides in a rain shadow and the northern end of the park was devoid of snow. There would have been approximately 20km of hiking with ski boots on our feet and skis on our packs to reach Buckley Lake. For future skiers, we recommend planning your ski trip in March and being prepared for alpine climbing style objectives. Thanks to the ACC for the Jen Higgins Grant for Young Women, Last Frontier Heliskiing for accommodation pre (and post) trip, and finally Colleen Gentemann for the photos. The Jen Higgins Fund was established by friends and family to honour Jen Higgins after her death in 1997. Jen’s enthusiasm and generous spirit continue to live on by supporting young women in creative, self-propelled mountain adventures with this grant.